This is what I’d *hypothetically” look like on that motorcycle. I have a dream..to live in a world where I can (for example, just a random one) be on a motorcycle in the pouring rain, motoring through the hairpin mountain curves of Danang, and have that experience be replicated in a 3d environment so others could experience it as I did – rain, wind, hairpin curves, scenery and all. AND…interact with those objects as if they were solid… because based on changing angles, I think the computer should be able to interpolate 3d shapes. I’m a dreamer. Beats sharing flat snapshots any day! All those amazing experiences, sharable in an immersive and interactive experience. How incredible would that be? PS there are people working on this. Intel for one, the Nokia Ozo another..and I’m sure many others. Am honored to be on stage at two events this week! Very excited. 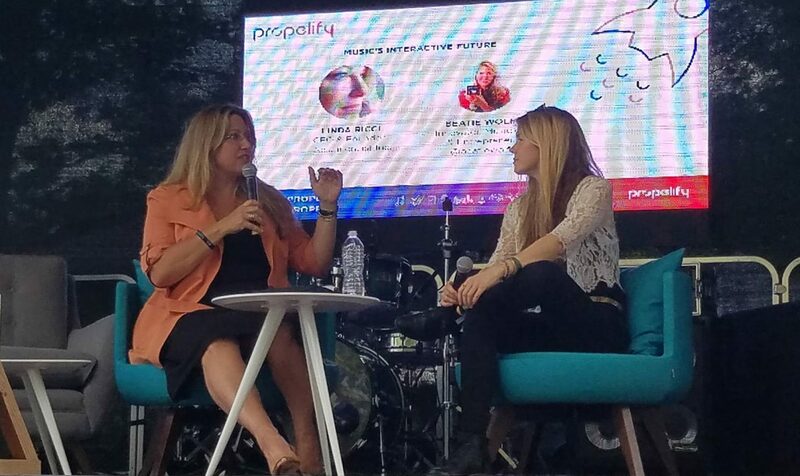 First up, I’m at the innovation festival Propelify on Thursday, where I will be fireside chatting with Beatie Wolfe for 25 minutes about music’s interactive future (South stage, 2:20 pm). Beatie is a musical innovator in addition to being an accomplished musician. At the forefront of pioneering new formats for music, she unites tangibility, storytelling & ceremony to albums in this digital age. Propelify is a celebration and exploration of innovation. Techstars and Samsung NEXT are sponsoring a startup competition (maybe I should apply?!) – and Arianna Huffington is giving the keynote address. Plus, a drone race. Which personally I can’t wait to see. Secretly I just want to be a drone racer. LyraVR is a virtual reality platform that lets you compose, perform and share musical compositions in 3D. Create loops, hand place and tune your sounds in space, press play, and enjoy as your musical masterpieces come to life around you. Geopipe builds immersive virtual copies of the world, built by algorithms, for architecture, real estate, and beyond. Their algorithms build immersive virtual models of the real world to provide visualizations for architects, urban planners, and many others. So many potential directions for that technology to go in! Can’t wait until I can walk through the any streets in the world with VR, without the bad buggies I always get when traveling. *Then* on Sunday (May 21), I’m part of a panel discussing the future of Entertainment and VR at Creative Tech week. Some great co-panelists! I’m in esteemed company. Victoria Pike is a theatrical designer and director who utilizes projection design and mixed reality technologies to create unique theatrical performances and installations. Her background in the theater, designing immersive experiences, has lead her to exploring 360 video and virtual reality as a new space for dramatic storytelling. Joel Douek is an award-winning composer and instrumentalist whose music has underscored many films and television productions, including in some of the most prestigious documentaries of the last few years – those of naturalist Sir David Attenborough. From big-screen IMAX features such as the BAFTA-winning film ‘Flying Monsters 3D’ and the Everest adventure: ‘The Wildest Dream’ (feat. Liam Neeson, Ralph Fiennes), dark thrillers such as “Manhattan Night” (feat. Adrien Brody, Yvonne Strahovski) and “The Tall Man” (feat. Jessica Biel), Douek’s music has brought many a scene to life. Jenya Lugina is a Creative with a deep understanding of technology. He constantly explores the newest developments and best ways to use them to push artistic boundaries and devise innovative solutions for clients such as Pfizer, Merck, Def Jam, HAVAS, Gold Crest Films, Cessna, Nissan, Fuji, Sony and Hasbro. He has worked as a Technology Consultant as well as a Creative Director, creating content for video, web, and interactive installations, using tools that include stereoscopy, autostereoscopy, and virtual reality to produce new ways to communicate messages. Cortney Harding is a professor, author, and consultant working at the intersection of music and virtual reality. Harding works with technology companies to partner with music artists and labels to create immersive, groundbreaking virtual reality content. Her knowledge of both the music and technology industries position her to uniquely create experiences that move both industries forward. Harding is the author of “How We Listen Now: Essays and Conversations About Music and Technology”, published in January 2016 and available here. Harding is a professor at the Clive Davis School of Music at NYU. Harding has been a frequent speaker at conferences like SXSW, Further Future, Canadian Music Week, SF Music Tech, and the Right Tech Summit.